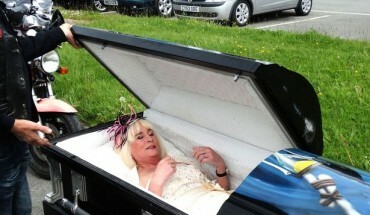 A 58-year-old bride, Jenny Buckleff recently shocked guests when she turned up at her own wedding in a coffin – meant for dead people. She said she did it because she wanted to be a different. In her words; ‘I just wanted to do something a little bit different. Instead of turning up in a horse-drawn cart, I thought I’m going to turn up in a coffin.” Her groom wasn’t in support at first, but she was able to convince him to reason with her. According to her she almost didn’t tell husband Chris but in the end she spilled the beans about three weeks before. He was a bit surprised but he said as long as she was happy he would go with the flow.